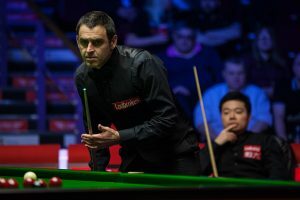 Ronnie O’Sullivan beat Ding Junhui 10-3 in the final of the Ladbrokes World Grand Prix, and has now won four ranking titles in a single season for the first time in his career. 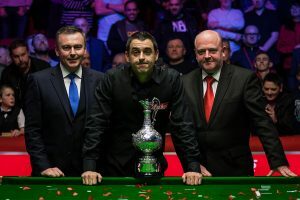 O’Sullivan made three centuries and three more breaks over 50 in a dominant display at the Guild Hall in Preston to take this title for the first time and capture the £100,000 top prize. It’s the 32nd ranking title of his career, leaving him just four behind Stephen Hendry’s record of 36. O’Sullivan has now won over £600,000 in prize money during the 2017/18 campaign and could become the first player to go past the £1 million barrier in a single season – indeed the £425,000 winner’s cheque at the World Championship alone would take him past that mark. 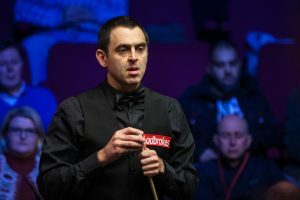 He had only once previously won three ranking titles in a season – back in 2004/05 – but having landed the English Open in October, Shanghai Masters in November and UK Championship in December, he has now surpassed that – and with five ranking events still to go this term. One more crown would see him equal the record of five in a season, held by Hendry, Ding and Mark Selby. At the age of 42, O’Sullivan has produced the most consistently excellent snooker of his career over the past five months, with his long potting, break building and tactical game all in superb shape. He remains second behind Selby in the world rankings but the gap is closing. China’s Ding missed out on the 14th ranking title of his career and second of the season, having won the Yushan World Open in September. The world number four banks £40,000 as runner-up. The first four frames today were shared, then Chigwell’s O’Sullivan pulled away as breaks of 124 and 105 put him 4-2 ahead. Ding won frame seven on the colours to stay in touch, but his opponent made 59 and 120 (his tenth century of the tournament) to lead 6-3 at the end of the first session. O’Sullivan took the first two frames of the evening session to extend his advantage to 8-3. Ding had a scoring chance in frame 12 but made only 16, then banged his head on the side of the table in frustration as the contest slipped away. O’Sullivan punished him to make it 9-3, and a quickfire break of 83 in the next completed the scoreline.